When I speak of fascism in England, I am not necessarily thinking of Mosley and his pimpled followers. English fascism, when it arrives, is likely to be a sedate and subtle kind (presumably, at any rate at first, it won’t be called fascism), and it is doubtful whether a Gilbert and Sullivan heavy dragoon of Mosley’s stamp would ever be much more than a joke to the majority of English people… But what I am thinking of at this moment is the fascist attitude of mind, which beyond any doubt is gaining ground among people who ought to know better. There are undeniable echoes of the 1930s in present-day Britain. We are told we are returning to 1930s levels of public spending, to 1930s equations of wealth distribution, and to 1930s levels of poverty and malnutrition. In the convivial, blokish, beer-swilling spectre of Nigel Farage, we are equally witnessing a return to 1930s attitudes to ‘immigrants in our midst’ who, we are led to believe, are muddying our culture, taking our jobs and blocking traffic on the M4. UKIP conform to Orwell’s prediction of a sedate and subtle English fascism that doesn’t go under the name of fascism, just as Farage, the political climber, has flown under the radar of not being taken too seriously. Then, as now, is a time for dropping off the fence on one side or the other. And yet political engagement, debate and voter turnout have never been more apathetic. It’s as if we are collectively wary of expressing an opinion or taking a stand lest it affect our employment prospects, our credit rating. What was once talked about as liberty and freedom has been subsumed into the notion of privacy, and with it a generation who, hunched over their glowing devices, tacitly accept they have ceded any rights to privacy to the all-seeing Google Stasi. It is the ultimate Orwellian nightmare. Walter Benjamin, also writing in the 1930s, talked of photography becoming the new literacy. Yet the photographic, literary intelligentsia, whose work and ideas are elevated onto the pedestal of the museum and the academy, still seem preoccupied with the contemporary equivalent of scribbling about Baroque architecture, art-for-art-saking, their souls above politics, reserving a curled lip for anything that might smack of issues. 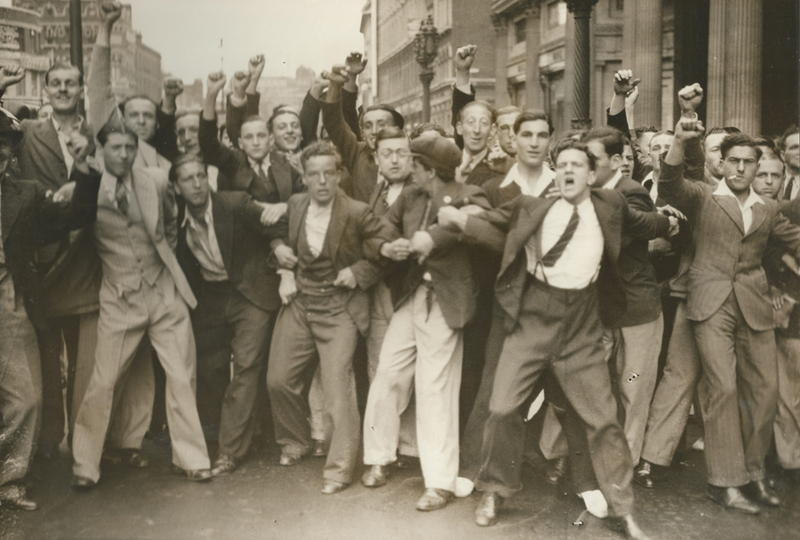 Of course, this press photograph of the Jewish, immigrant and socialist East Enders ‘holding the line’ against the arrival of the Mosley goon squads in Trafalgar Square isn’t what it appears. It’s a performance for the camera, and something of a fashion shoot – a promise of a conflict that never came. Mosley’s phalanx of black shirts never made it beyond Camden Town. But it lends a certain narrative for which there is little appetite in the narcissistically reflective, shape-shifting bubble of conceptual art. In this age of illusion and confusion, photography might still have a role in plugging the narrative void. Roger Hargreaves curates the press collection of the Archive of Modern Conflict. A lecturer, writer and curator, past awards include the J Dudley Johnston Medal, the Kraszna-Krausz Foundation Book Award and the Maine Golden Light Award for writing on photography. His recent projects include the exhibition Cutline: The Photography Archives of The Globe and Mail, the first exhibition of Canadian Photography Institute that launched at Scotiabank Contact Photography Festival in May 2016 and the exhibition and publication, Amore e Piombo [Love and Lead]: the Photography of Extremes in 1970s Italy, co-curated and co-edited with Federica Chiocchetti for the Archive of Modern Conflict, which explored the ‘viscous mystery’ of the so-called ‘Years of Lead’ in Italy. In another life he would have enjoyed being a paparazzo in Fellini’s Rome.